JOHNSTOWN, PA, February 12, 2018—First National Bank (FNB) has made a $4,500 charitable contribution to Goodwill of the Southern Alleghenies through the Pennsylvania Department of Community and Economic Development’s (DCED’s) Educational Improvement Tax Credit (EITC) Program. Goodwill is a state-approved Educational Improvement Organization under the program, qualifying the organization to receive contributions from businesses who apply to reduce their state tax liability. Contributions to Goodwill through the DCED’s EITC Program enable public schools to systematically choose Goodwill’s Innovative Educational Programs that are not feasible through schools’ current budgets. Goodwill will apply FNB’s contribution to a variety of educational and career-related services for students. Madonna Miller, FNB’s Senior Vice-President; Christine Griffith, FNB’s Manager, Johnstown’s Main Street Branch; Amy Horwath, Goodwill’s Vice-President of Mission Services; and Bradley R. Burger, Goodwill’s President and CEO. 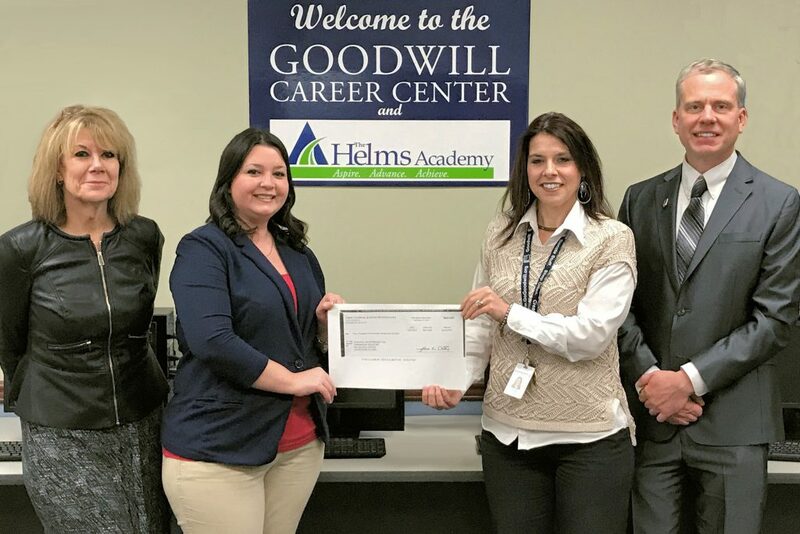 “Goodwill will apply First National Bank’s generous contribution to support programs designed to help prepare today’s youth for the workforce through workforce-readiness skills teaching, job support services, career exploration, and career development,” stated Bradley R. Burger, Goodwill’s President and CEO. “We greatly appreciate their support,” he added. For information and instruction on reducing state tax liability through a contribution to Goodwill, visit www.GoGoodwill.org/eitc-contribution. For information about Goodwill’s Innovative Educational Programs, please contact Amy Horwath, Vice-President of Mission Services at (814) 536-3536, ext. 287 or ahorwath@gogoodwill.org.